From the brimming basket itself to the goodies within, Easter has become a true gift-giving occasion. With sugar-coated marshmallow chicks and giant chocolate bunnies, there are endless ways to give your little ones gifts that fit this beloved holiday’s traditionally sweet offerings. But with the health of children top of mind, some parents are using this special springtime occasion as a way to give better-for-you gifts that stimulate the brain and inspire creativity. This Easter, instead of giving unhealthy candy that only lasts a few bites, consider long-lasting gifts that inspire the imagination and provide endless hours of enjoyment. Here are some creative giftgiving ideas for your little recipient. Explore artistic worlds Foster some artistic spirit with a basket filled with paint brushes, pastels, papers, molding clay and other imaginative tools. Just be sure to buy supplies that are age appropriate and safe for the recipient. Encourage pretend play Give kids toys that allow them to express them selves, such as the Hopscotch Rabbit Family from Calico Critters. It is one of many cute and lov able critter families your child can collect this Easter. These award-winning miniature animals promote whole some family values and inspire the imagination. Begin a love for books Let the adventures begin with stories your little ones will want you to read them over and over again. Look for seasonal books that share the stories of the Easter holiday or those with a springtime theme. Dress up for fun Let their inner princess, super hero and ballerina shine through by lining their basket with a variety of colorful, fun outfits and accessories. Dress up play encourages hours of imaginative play and can even allow the parents to join in on the role playing excitement. Build the mind From oversized pieces suitable for tiny tikes to complete, intricate sets for older kids, there are many great building toys for children of all ages. Since they’re loved by all, building block sets are a great choice for families with boys and girls. Create beautiful music From mini xylophones to tambourines and recorders, add some booming beats and expressive harmonies to their day with musical instru ments. Include a lesson book with songs and they’ll be playing a tune in no time. Discover outdoor play Unglue them from their tablets, smartphones and televisions, and encourage outdoor play for stimulating physical activity. Tuck a basketball, kite or even a jump rope inside those baskets and it’s game on. Plant the seed For the budding gardener, fill those plastic eggs with seeds and give them gloves, shovels and terra cotta pots to begin their own garden. They will learn a valuable lesson about how plants are grown and some pointers on responsibility, too. Get crafty Beads, baubles, yarn and other craft goods allow children to create anything they put their mind to. Visit the clearance section at your local craft store to find a variety of materials young hands will love to work with. •Make discovering the basket part of the fun with a treasure hunt using a series of hidden clues or a handcrafted map. •Ask your children to join you in preparing and delivering baskets to a senior living residence in your community. 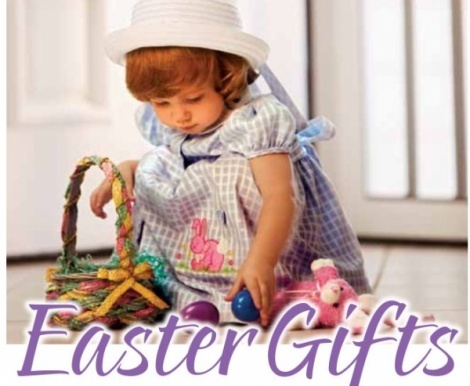 •Theme your baskets for a family activity, with each child receiving a critical piece of the overall project. For example, one child receives a garden spade, another gets packets full of seeds, and so on.